I can't believe that tomorrow is Oct. 1st. Whew, where has this year gone? As most of you know, National Card Making Day is also quickly approaching, October 5th. But, before we get to all of that...I wanted to share a little indulgence with you: The Marburger Farm Antique Show, which opens tomorrow! If you are like me, you have never heard of this event. So, grab a cup of coffee, a cold beverage, pull up a chair, and get comfy. I originally heard about the Marburger Farm Antique Show, while reading my first copy of Where Women Create. I picked up this magazine, because I wanted to read about talented, creative, successful, crafty women, who have turned their passion into a thriving business. The whole thought, of making a living crafting, creating, and designing home-made gifts sounds delightful. I am smart enough to know, that I can't make 'Nuclear Medicine' money, crafting. But, to make a steady paycheck doing what I love, what I have a passion for, is rather intoxicating. I degress. Ok, so there is a european-style flea market held every fall and spring in Round Top, Texas. Sounds interesting. Sounds fun, adventurous, and a true treasure hunt! 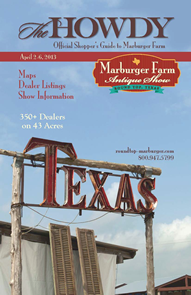 This outdoor Texas antique show features more than 350 dealers from all over the United States of America. The farm antique show, sits on a 43-acre field, and that houses 9 tents, and 12 historic buildings. Alot of space, alot of stuff to see, touch, feel, buy! This show also claims that it is 'an extraordinary place to shop of a variety of antiques', which translates to an opportunity to explore and discover treasures of all sorts and sizes! When I first read about this show, I wanted to call up some wonderfully sweet girlfriends, and organize a road trip! But, we all have busy lives, so I didn't even tempt them. I tried to recruit my daughter, but this isn't her sorta thing. I did a bit more digging, and they have a spring show, too. So, I am making travel plans to go to Round Top, Texas in April. I really want to go, to browse the tents/buildings of vintage treasures that long for a new home, a little care, and some TLC. So, this spring, I will gather a few girlfriends who can appreciate this type of flea market, and travel to Round Top, Texas. We will need to catch a flight to Houston, and then driving across a brilliantly decorated Texan landscape covered with bluebonnets, making our journey beautiful and memorable. To shop 'booths' of antiques, vintage dealers, artisan exhibits, that include American, French, English, Continental, modern, industrial, architectural, fine art, jewelry, silver, western, garden, textiles, Texan crafts, and so much more! Labels: farm antique show, round top.